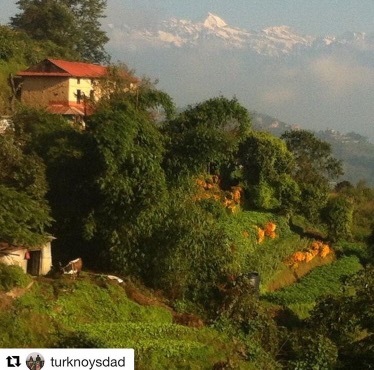 Nepal – Turknoy Travels 100! 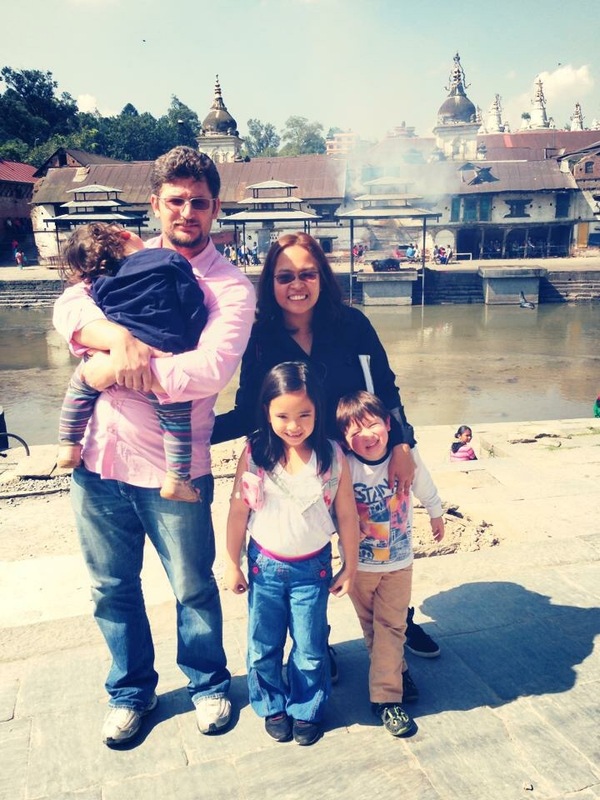 August 2, 2016 August 2, 2016 by turknoys, posted in Education, Nepal, Travel Adventures, Why Travel With Kids? Nepal is beautiful country. With the country’s majestic landscape, the country has more to offer than any countries of Europe we’ve been to. Add in the Mt. Everest, nothing less than the tallest mountain in the world, to explore, to conquer, to use as magnificent backdrop, or to just admire the wonder of nature at its best! It is no surprise that there are a lot of tourists visiting the country, no matter the season. waking up to this for several mornings is serenity! Nepal is different to our eyes. Instead of churches or mosques, there would be Hinduism temples. There are holy cows (no pun intended) freely roaming everywhere in the country. Holy people basking in the sun, conquering the feat of being holy. 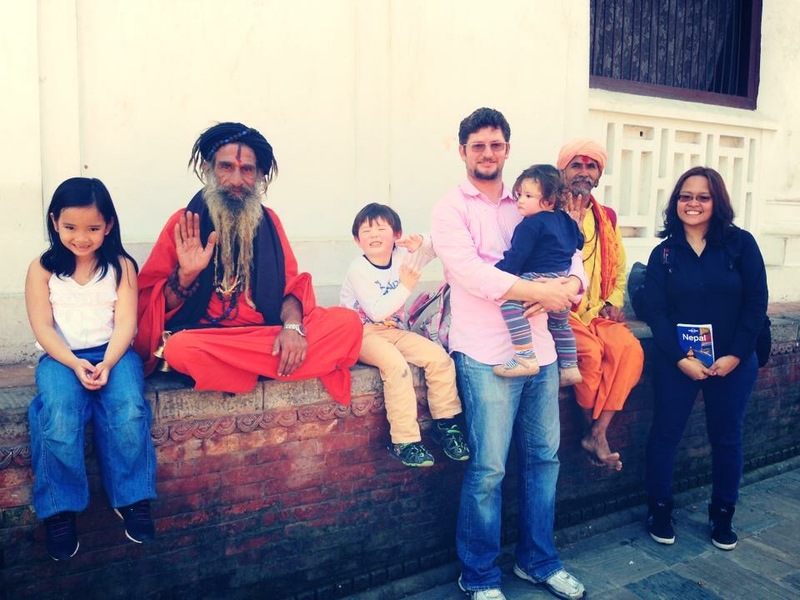 It is refreshing to see a new perspective on religion, while enjoying the Himalayas. It is humbling and interesting experience of all family members. Ten days in the country left us in huge awe with lots of questions about our lives’ priorities. We didn’t see huge mansions or tall buildings yet most of the houses have open rooftops to be able to view the Himalayas freely, probably with a cup of coffee or tea. What a blessing it is to be able to look at the world’s highest peak any given time! Yes, there are no luxury cars, fancy houses or maybe even state of the art appliances and expensive furniture! But who really is richer? Uhhmm, that is a rhetorical question for someone who has wisdom. To experience nature is to live. To actually see beauty of nature in this purest form is to be alive happily! This makes traveling to Nepal worth everybody’s while. 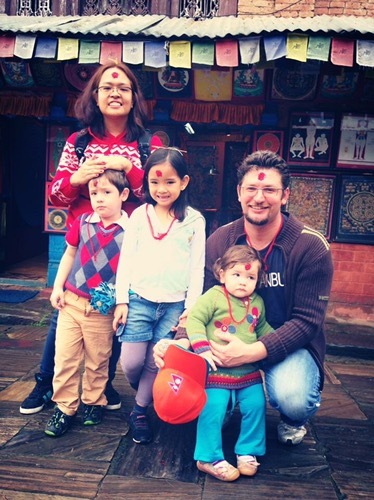 We visited four major cities in the country, Kathmandu, Pokhara, Nagarkot and Patan. Going to Pokhara to Kathmandu, we followed the land route. We instantly regretted this when we saw two trucks falling off the road, and our local driver nodding it off like it’s the most normal event in the world – “The land route “normally” have two or three accidents daily.” Well, it was not in the tourist information! I don’t remember the kids huddled so closed together for the remaining four hours of our land journey! 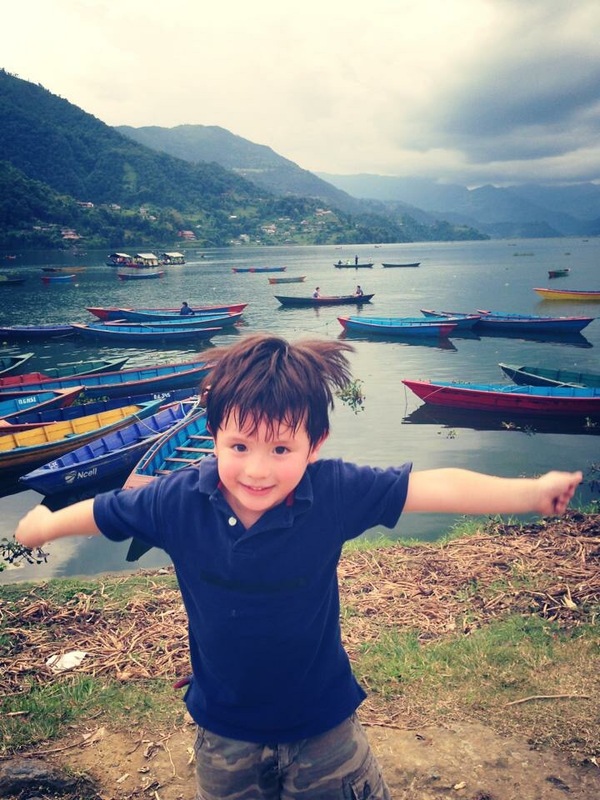 Pokhara – Hello Annapurna for Two Days! such carefree joy by the lake! 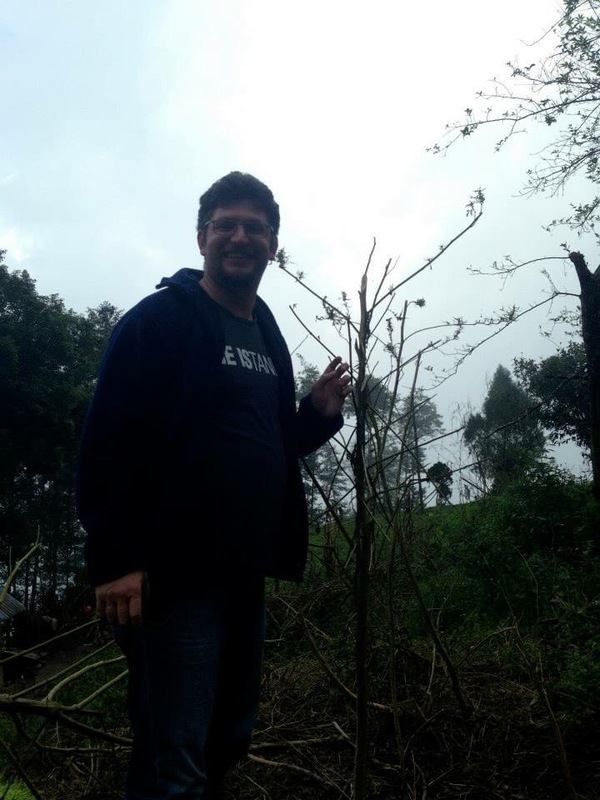 We feasted our eyes waking up the majestic nature scenery and marijuana plantation (we kid you, not!) 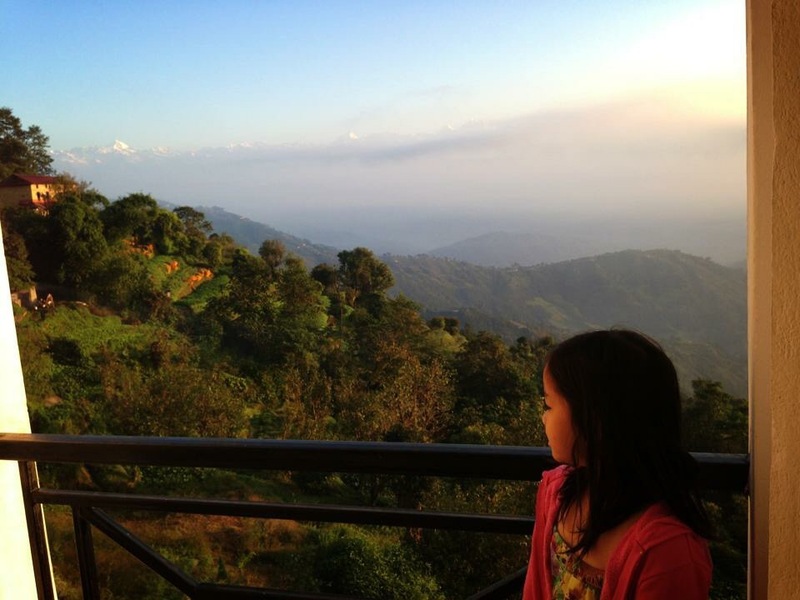 We checked in a hostel in Nagarkot where we didn’t need any hotel amenities, the view in itself is the attraction. The highlight of our trip, is of course, the Mt. Everest Flight. It was a great experience for the family. 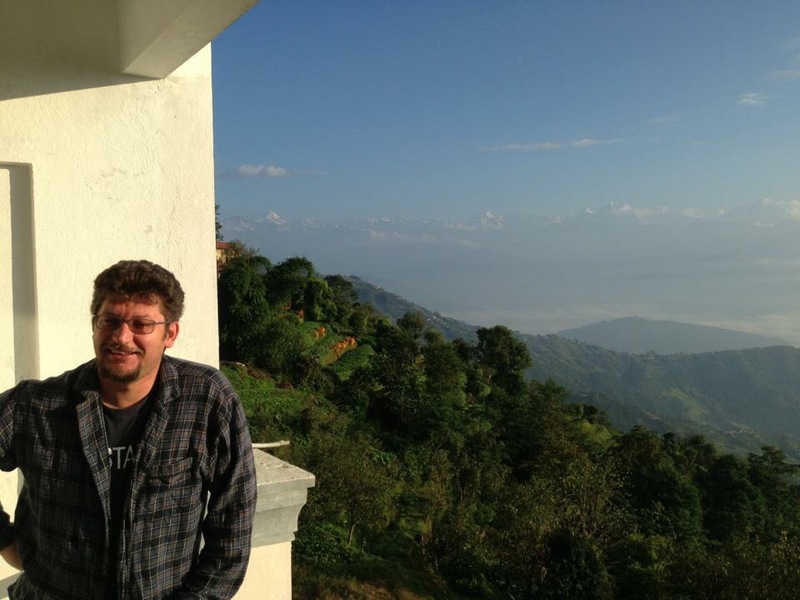 Seeing the Annapurna and peak of Mt. Everest from an airplane with fellow tourists – the oohss and the aahhhhs! It is an experience of the lifetime. 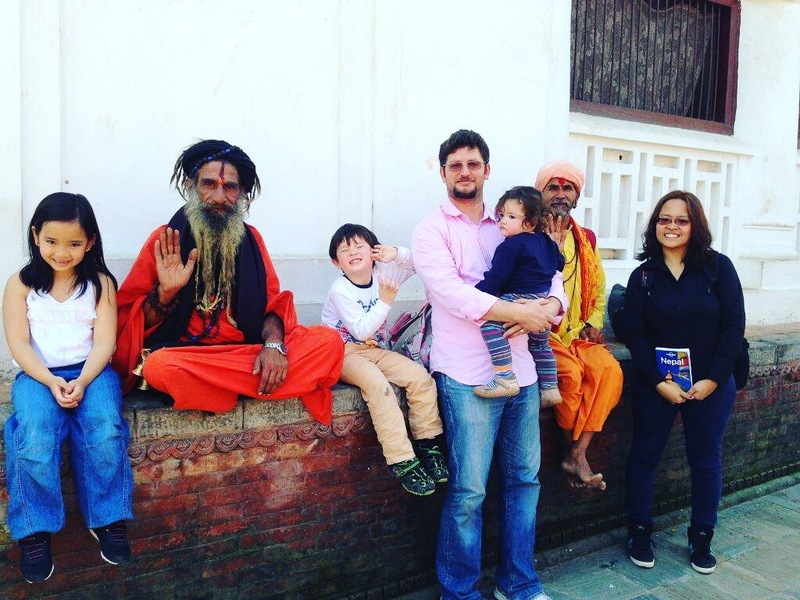 More memorable,though, will be how friendly the Nepalis are. Where we live, there are a lot of Nepalis working, expatriates like us. Their noble intention to not cause any harm to anyone or anything is just something that makes us want to convert to Hinduism (being overly simplistic here). There may not be infrastructures, even the basic ones, in Nepal. The feel-good feeling over any luxuries in life, hearts over pockets – that we could use all of us, any day in our lives. For our family. Nepal means kindness. To experience that fully from both ways is how we should live fully. Keep Calm, Travel and Be Late. During my first few days as expat, together with my fellow newcomers and future colleagues, we take the bus from the hotel to get to the Head Office. There’s this person, tall, very handsome and kind fellow who is always tardy, always coming to the bus few minutes late. One day, he was left behind by the bus because he was exceeded the 10-minute late waiting period – he was that late! Serves him right, I remember myself thinking. He may be nice, but he has no respect for other people’s time and nobody should be forced to wait for him while he takes his own time. That day when he was left behind by the bus, going back to the hotel, he had so many stories about the new place where we’re in. He was able to get to know the environment, shops, routes and transportation mode. Seemed like he became famous instantly because he was the most knowledgeable person in our group about the local culture. Because he was late, because he didn’t rush, he opened himself to other experiences destined to happen. This is the same person who will wait last minute for the final boarding time before actually boarding the plane. The same person who’s name will be called because he is sometimes late, “Mr. Turknoy Dad, you are now requested to please proceed to Gate X. This is your final call.” Great, now everybody at the airport knows who his name, instant fame all over again. He didn’t have to wait at all nor look at the Gate number! See the good pattern here? The airport staff is assisting to make things happen for him , to catch his flight. This is the same person who will keep still and calm looking at magnificent view for hours, savoring every moment of solitude, who doesn’t need to meditate because he is subconsciously meditating. This is the same person who will hang out with his wife (me, I am the lucky Turknoy Mum!) for hours and days (prekids time) without checking his phone or getting bored staring at my face, just listening to what I have to say. Gently talking, gently loving me in his calm, awesome ways. This is the same person who travel with kids patiently waiting for tantrums to end, for wife’s hormones to subside, for certain activities which kids like to do to be completed so that he can proceed with what he does best, exploring very minute of the new place we are in and enjoy! It does help to be calm and late most of the time. When we stop and take a look at it, life is meant to be savored, not be hurried through. 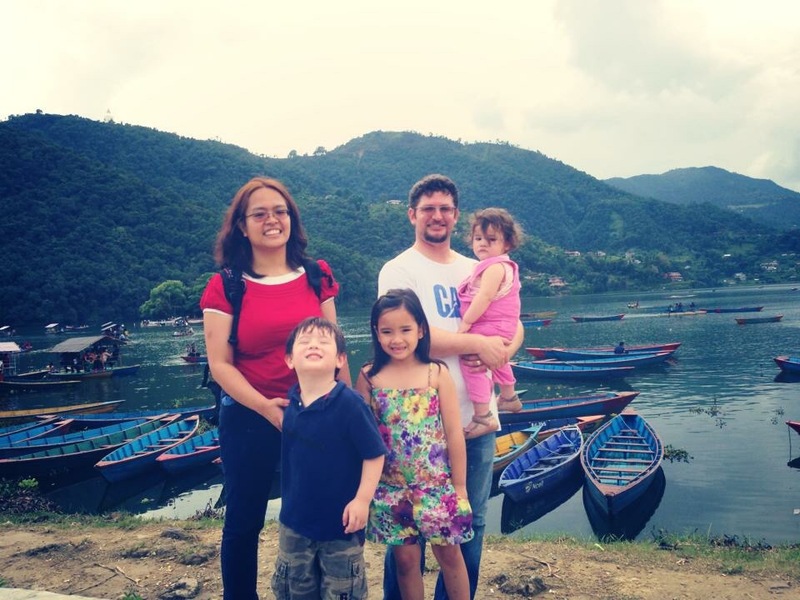 His calm and non-hurried ways became our family’s way of travel and living. It is natural for Turknoy Dad which he luckily passed on to the children. The go-getter career woman in me is most of the struggling but as our travel goals roll out, I am getting there, one travel at time. Yes, there are train, plane or bus schedule to catch. But we don’t have to be defined by these timings. There are greater energy in this world that gives pull and push towards our destiny, if only we let it. The hurrier I go, the behinder I get! – The same White Rabbit, in the same classic story! “This is it? !” – This would make the top 5 statements the Turknoy kids say all the time whenever there is a travel landmark or bucketlist we aim to go. “This is it? !” whispered Turknoys Dad when reached Venice. This is an overrated touristic city. Yet, when the rained poured and the city of Venice overflowed, he was thrilled like a 3-year old while ranting about the cold and wet feet we had. ‘This is it? !” said our eldest daughter, sarcastically, on top of the Burj Khalifa, the tallest building in the world when she just saw brown everywhere and desert view below . Yet, she was shrieking in delight when inside the elevator especially when the floor level reached about 100! “This is it? !” shouted our son from the top of the Eiffel top while we are all in awe looking out the gorgeous view of Paris. What a classy and posh city Paris is, yet our five year old was not impressed. Yet, he was ecstatic playing under the Eiffel Tower and amazed with the architecture of the tower while climbing up the tower. “This is it? !” shouts our youngest curly baby pretty much all the time. Yet her laughter inside the trains, planes, cars, if she is in a good, non-sleepy, non-tired mood, is very priceless mixed with the laughter of all family members. It’s the travel, the journey. Most of the time. Not the destination. Not the arrival. This is it?! That’s not it! There’s always more to it. All the time. It’s the travel. Atlas wasn’t forced to hold up the world. He was convinced that if he didn’t, the world would fall. Atlas is the Titan God of Astronomy and Endurance. Endurance? Who endures astronomy? Astronomy is an exploration, a fascination for all of us, the endless journey into the unknown and timeless magnificence. Astronomy should be an endless and timeless exploration. Not an endless and timeless endurance. Yet, somehow, Greek mythology managed to tame the wild and free souls of ancient people. As early as those ages, we are scared to have unlimited boundaries to explore, so we bury ourselves with the preconceived irony of life. God of Astronomy and Endurance. Yes, you have the capacity to explore yet you should choose to stay put and hold up the world otherwise, if the world would fall then you are a failure at being god. You, Atlas, should endure the responsibility of the world! But, hey, it’s your choice! You are God of Astronomy, you can explore the universe. But remember. You are also God of Endurance! Don’t enjoy exploring too much that you forgot to endure and suffer with your responsibilities to the world. See the ironic sense there? We do. It’s very obvious. We see it in all patterns in life. Each of us have become our own version of “Atlas”. We hold the world in a certain standard because we were told to, expected to. Otherwise, the world would fall flat to our faces with shame and embarrassment. We all have responsibilities, we all need to hold up the world. Otherwise, the world would fall. The people around us would crumble. We are all raised to conformance. Raised to follow a certain pattern in life set by our parents, by our religion, by school and by society. We get so molded by norms, rules, commandments, expectations that being a good person means full compliance. Being human, we all scream to be free, to be wild, yet we are tamed to conformance. We are tamed to follow order. Yet, we are always reminded by the same institutions who mold us that we are free. That everything we are now is because of our choices! And yes! Like Atlas, we all believe that we are free to choose the life we want. This seems like an immense illusion? Yes but there is a bigger illusion. The real illusion is not the free choices we make in life, the bigger illusion is the world falling, people around us crumbling! The odds of those happening depends how we look at the illusion of our roles in carrying the world. If Atlas only learn to let go of the world, the world would carry him and continue its rotation and revolution, playing its part in the Universe. Nobody should carry the world on its shoulder. Nobody can. Our existence in this world is important. It is. Because it is unique! Nobody is responsible for our existence but ourselves. We are responsible for our own choices, for our own way of living life. If we screw it up, then we only have ourselves to blame. See that highest peak in the world, Mt. Everest? It’s within anybody’s reach! Especially for this kid! That is way more scary right? To be responsible for our own decisions? Then we have no one to blame? Can’t blame our parents, our religion, our school, our society? If we stood our ground and live the life we always wanted, and we fail, that is a huge slap to our faces. Why risk those odds? Let’s just conform and be the majority. Let’s continue holding the world, because the world will not fall and we will be safe and conforming. For our family and with our travel goals, Turknoy Travel 100, we choose to let go of the world and enjoy the view of the world’s rotation and revolution, as it should be. We aim to travel. A lot. We don’t send the kids to school because we believe in learning, not indoctrination. We do not belong to any religion, we believe in God strongly. Our ways and means of parenting are frown upon by elders and society, we listen, to them but we make our own decisions based on the uniqueness of our children. Our children are unique individuals. Parents are happily together with similar goals in life yet we cherish the differences in our personalities. Who we evolved to be will be based on how each one of us wanted to evolve. Everybody is unique. We can’t carry someone else’s responsibilities for themselves. Not family. Not school. Not religion. Nobody. The world is there to be explored, not to stay on our shoulder and treat as a burden. That is one mythology we are willing to tell to our kids. 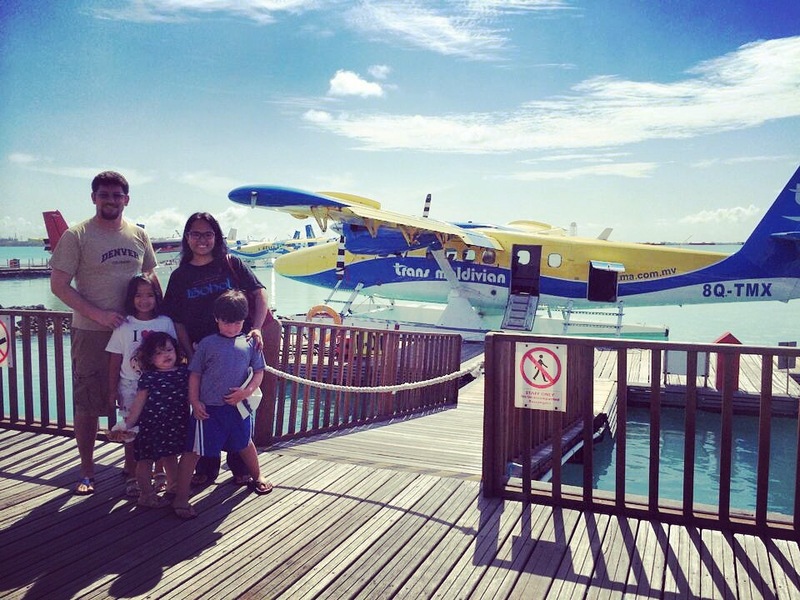 The picture of traveling with kids used to give me images of whining, crying, outbursts and lots of kicks at the backseat of the plane (oh that poor passenger!) Not to mention the screams of “I am tired.”, “My feet hurt really bad, we are walking for hours!” and “We are starving.”, shouts of suffering like we subjected them to the huge amounts of torture while traveling. And yes, that look of fellow travelers, and locals in the area… The – “What are these parents thinking?”-look. And the “Some people should not be parents!”-look, joined with “Oh these poor starving, tired kids, being dragged by their parents to foreign, scary places.” – look. Side note: We don’t like judging the people we meet on the road when our family travel but we like to judge ourselves through the eyes of these people. That is a bad habit and we are working on that. We like traveling with kids because of the golden moments. Kids are pretty good at being in the moment, enjoying the moments. Experience people, places and events in their wholeness. To be mindful of the moment. To be a child again with no worries. This is our golden take away from life’s experiences, what we always observe when we travel with our turknoy kids. We constantly move places to evolve, to travel. Yet when we are in certain place, we let the place evolve us. Enjoying the place, the people in their wholeness, that is what makes traveling a pilgrim. It’s so easy with kids to identify what they appreciate and what they don’t. When we take them to museums, their body languages tell us what they love to see. It doesn’t matter if it’s a famous painting or sculpture. They are not influenced by the preconceived notion or majority’s view of what is great and what is awesome. Their eyes know and seeing that spark every time they see something new for the first time, and they love it, that’s appreciating something in their wholeness. What is not easy however, is for us, “molded” adults to let them choose and enjoy their own moments. When all the kids didn’t like to be among the crowd who wanted to see Mona Lisa in the Louvre, Mom and Dad were like.. “Uhm, what the?! 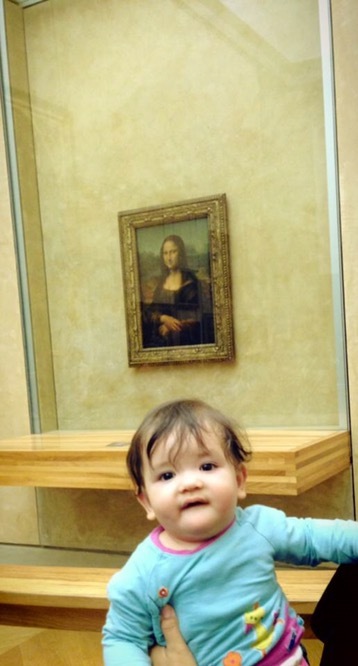 We took you to Paris and Louvre so you can see the magnificence of this painting, world-class, timeless masterpiece and.. you don’t want to wait your turn to take a picture with Mona Lisa?! Are you all kidding? (or in our mind – are you f*&%ing kidding us?!) A million kids would want to have your place and see this once in a lifetime opportunity and you want to pick your sister’s nose?! (True story!) – to which they replied: But, Mom, she has something in her nose!.. and it seems illogical at that time. And truly a waste of time and lots of euros! These kids chose picking Kayra’s nose over oogling and admiring Mona Lisa. And when we forced them, they turned cranky and grumpy followed by a lot of whining! That doesn’t sound like a “pilgrim” to anyone. Well, it certainly didn’t sound like a pilgrim for us then and now. Just a making a point here. No judgment, remember? The hardest part of traveling with kids, and parenting kids, in general is when we take them to certain places where we want them to look at what we think are awesome, magnificent masterpieces and they choose to look elsewhere, to what they think are awesome, magnificent, masterpieces. 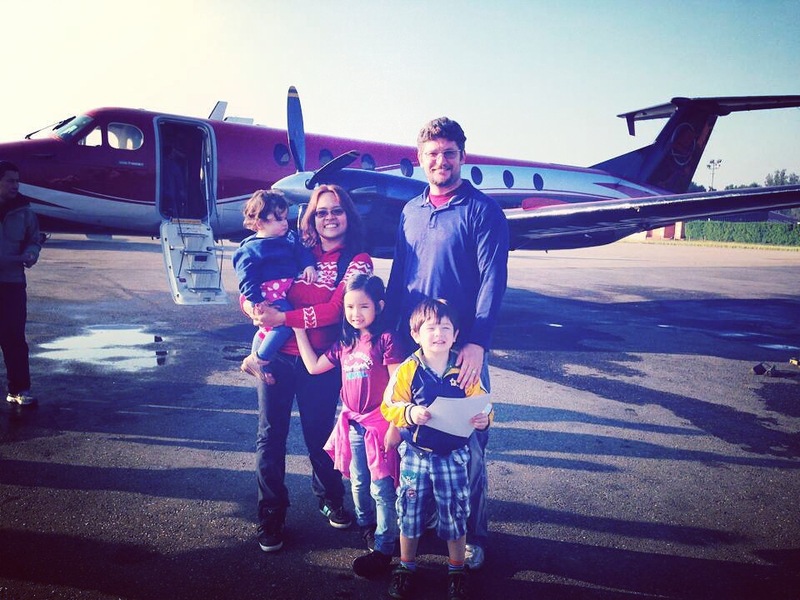 Traveling with kids doesn’t not mean they are going with the flow and itinerary of the parents. 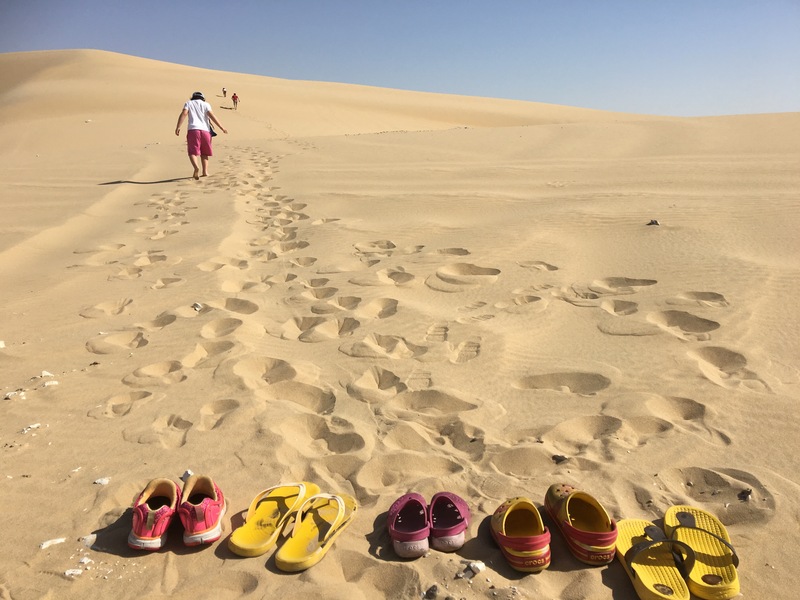 Traveling with kids, as difficult and inflexible it may sound, means five different minds and hearts each finding their moments and wanting to be transformed by the journey. 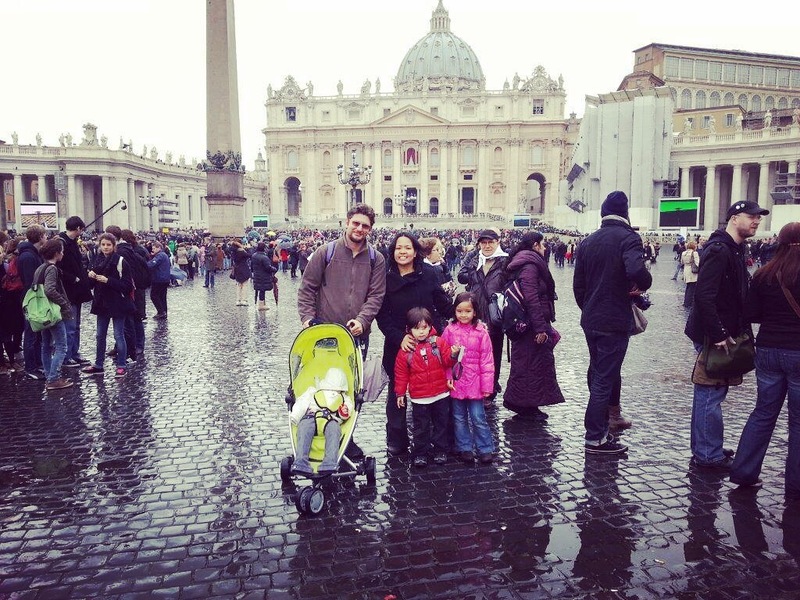 After exploring several countries, we are slowly learning to let go and have the kids enjoy their own journey leading to their own pilgrims. It didn’t even bother us when they chose hanging out with the pilots instead of looking at how great and magnificent Mount Everest peak is. We had to emphasized to ourselves that the peak of the highest mountain in the world is magnificent for us, what is awesome for the kids are the pilot and co-pilot navigating the plane. There is nothing wrong there. 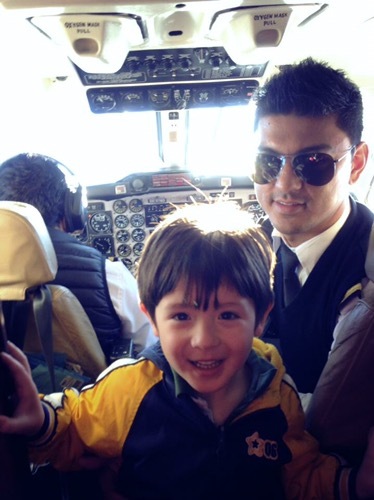 Our Turknoy enjoying hanging out with the plane co-pilot instead of enjoying the peak of Mt. Everest! Kids are pretty good at being in the moment, enjoying the moments. Moments important for them, not by dictated by anyone or anything. That’s how kids evolve. That’s how people evolve and learn from places and experiences. Now, our picture of traveling with kids give us images of Darwin’s Theory of Evolution, images of three cheeky monkeys transforming into three awesome, strong willed adults equipped with passion and memories to change the world. That’s an image worth the torture, uhhm….Yeah, I mean challenges when trading with kids.